Here it is, the Mediterranean diet food pyramid, your low glycemic guide to Lifetime Fat Loss! To understand how much of each food group you need for your low glycemic eating plan, keep reading. A healthy weight has everything to do with nutrient consumption. The body constantly needs the raw material to rebuild itself, power itself and maintain good health. When we don’t do that we see the results, obesity, diabetes, and heart disease. These are the recommended proportions of food groups to eat to be slender and healthy. Look at the bottom of the Mediterranean diet food pyramid and make these foods part of every meal and every snack. If you have type 2 diabetes, insulin resistance, metabolic syndrome or obesity avoid all sweets. Most of your day's food is vegetables (including salads) and some fresh fruit with one quarter being whole grains, which can include oatmeal, quinoa, brown rice, legumes or beans, raw nuts (or nut butter,) and some seeds. Base every meal and snacks too on these foods. You can eat them raw or lightly cooked. You do NOT need animal protein (including eggs, fish, dairy) more than once or twice a day and vegetarians get along fine without any. Eat fish as often as you can, daily to 3 - 4 times a week. Meats and sweets you need least often, no more than two or three times a week. The sweets should be low glycemic ones and better to stick to low glycemic fruit for your sweets if you are insulin resistant. Americans tend to consume more meat than is healthy and more than is necessary at one meal. Instead of eating slabs of meat, slice a 4 oz. steak into small pieces and serve two people when you stir fry it with vegetables. You could serve it with barley, quinoa or even brown rice which has a moderate glycemic index. Eat a hearty meal like this for lunch and then just have a salad or yogurt for dinner with a green smoothie. This is a heart healthy, diabetic diet, the low glycemic way of eating. You can call it a pre-diabetic diet, you can call it food for life. It's the way to health and permanent weight loss. Don't eat whole grains with protein in the evenings. Either have protein OR grains, not both. It's better food combining and easier on your digestion and your waistline. The best whole grains for losing weight are the low glycemic ones. Our ancestors were hunter gatherers and consumed far greater amounts of food that they had to work hard to get. We need less food but one could argue that we need more nutrients not less. We live in a toxic environment and our food is grown in soils less rich in minerals. But our human genetic constitutions have not changed much in the past 40,000 years. We still need the nutrient dense foods, just far less of them. However, what we eat and how we eat has changed dramatically. Before agriculture our hunter gatherer ancestors were as tall and stronger than people in the affluent societies of post agricultural times. They ate low glycemic, high quality, nutrient dense foods. 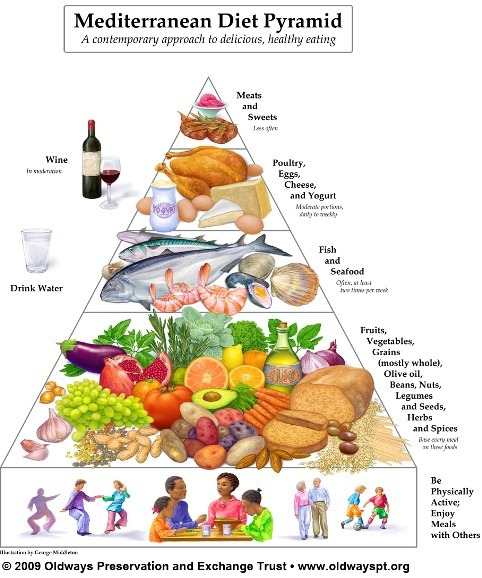 They ate like the bottom rung without the wheat of the Mediterranean diet food pyramid! They ate many species of fruits and vegetables maybe hundreds, roots, beans, nuts, tubers, nuts and seeds. This diet gave them vitamins, minerals and a huge variety of phytochemicals. They ate an abundance of wild animal protein and got vast amounts of the omega three fatty acids in nuts and seeds. Once we settled into agricultural based societies we became dependent on a few food staples like potatoes, rice, wheat and corn. Our lifestyles gradually have become more sedentary. Machines do a lot of our work and children today sit in front of videos and computers instead of playing outdoors. We are less active and get fewer nutrients - no wonder we developed the modern diseases. Notice that the agricultural staples today are often highly refined, high glycemic carbohydrates! As our diets became more and more refined and “industrialized” we became more and more interested in sweets. Our blood sugar was raised by the staples, we discovered cane sugar and over time began craving sweets. No surprise there! And then we developed the sugar diseases which are rampant in today’s world. We have to eat a better quality of food today because our dietary requirements remain the same as our ancestors although we need far less calories to live. We have such a need for nutrient dense food that unless you are eating like the Mediterranean diet food pyramid above, you are probably missing vital nutrients. The Mediterranean diet is a food lover's diet and also the way to eat for real health and a lifetime of fat loss! * This food pyramid is reproduced here courtesy of Old Ways Preservation and Exchange Trust, a wonderful organization committed to preserving cultural food traditions. Return from Mediterranean Diet Food Pyramid to Traditional Mediterranean Diet. Return from Mediterranean Diet Food Pyramid to Lifetime Fat Loss home page.